I visited Carolina with my daughter to look a the prom dresses. 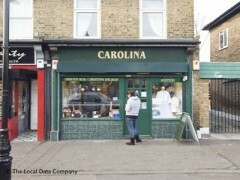 The owner was very helpful and we picked a lovely cream & gold floor length dress. We were assured that no other of the same dress would be sold to anyone going to the same prom. A second fitting was suggested as the dress may need minor alterations which could be arranged. When we went back to the shop for the fitting the owner had thoughtfully arranged a smaller size and this fit my daughter perfectly avoiding the need for alterations. At the same time she suggested that if we had problems finding a suitable bag to match she would be happy to also look for us. Very happy with the service received and highly recommended. My daughter won the award for the best dress so happy all round. Many thanks for a stress free experience.